One of our readers brought my attention to an earthquake that struck Asia Minor in 17 AD right in the middle of the area that would later have the seven churches of Revelation. Pliny the Elder called it "the greatest earthquake in human memory." It essentially destroyed the western part of what is now Turkey, toppling more than a dozen cities - several of which were the very cities that would host the churches to which John wrote more than a half-century later: Sardis, Philadelphia, Ephesus, and possibly even Smyrna. The earthquake was especially devastating because it occurred at night when everyone was asleep and unaware (remind you of a Scripture or two?). 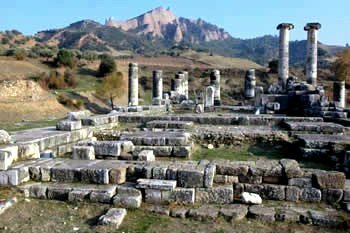 The Lydian Earthquake, as it was called, was so powerful that Roman trade in the region essentially stopped overnight. Tiberius Caesar waived all taxes from the region for a period of five years and sent a massive aid package, so that the people could rebuild. Now here we are, exactly 2,000 years later, discussing the book of Revelation again and the possibility that some of its future prophecies may be fulfilled this year in 2017. Does anyone happen to know the date of this earthquake? I would love to know, as it would have a great bearing on some findings of my own about AD 17 and possibly the crucifixion. But if the AD 17 earthquake was centered in Turkey, then it would not have been the earthquake at the crucifixion. It's a very interesting earthquake, but imho, not the one at the crucifixion. There are many data points that place the crucifixion in 31, 32, or 33 AD. In Daniel 9 we are given the "COMING" of Messiah (not His birth or death) as being 483 X 360 (173,880 days) from the going forth of the command to build and restore Jerusalem. That command was given to Nehemiah in chapter 2 in the 20th year of Artaxerxes in the month of Nisan. Xerxes was assassinated in 465 B.C. and was succeeded by Artaxerxes making his 20th year 445 B.C. Nissan that year was March 13th to April.Counting days makes no difference to which calendar is used 173,880 days from then brings you to April of 32 A.D. 33 A.D adds another year of days to the calculation which CANNOT fit. It also makes 17 A.D. way, way too short a time to fulfill the scripture given by Gabriel to Daniel. I believe the scripture. How about any of you? "I believe the scripture. How about any of you?" If anyone here didn't, they wouldn't be posting at this website, now would they? That's the kind of comment where even if you're right, you're wrong. It isn't going to kill you to check your attitude at the door. Thanks. Hi! Does anyone happen to know if there is record of an earthquake in any of the possible years of the crucifixion from 30 AD to 33 AD? The birth of Christ was in 25 BC and is confirmed that on Tishrei 1, 25 BC according to the law Feast of Tabernacles (God with us), 8 days later is the Day of Atonement or Yom Kippur, Christ received his circumcision on this date and his blood shed for the first time, 33 more days Mary would present herself to the temple for offering according to the law to be clean. You see 17 AD is correct. The but one still needs to count for the zero year. Another Study I read places a great earthquake in that area at about 33 AD.